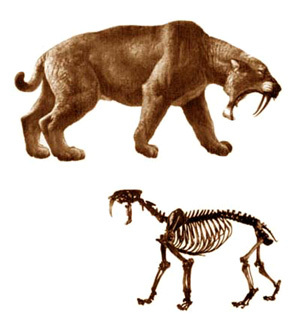 Smilodon fatalis, which has been extinct for 10,000 years. optimized to resist the extrinsic loadings generated by struggling prey,"
models that simulate its bite in action. stress hitting the cat's lower jaw and gigantic upper teeth. In contrast, the computer-modeled lion skull mostly stayed cool blue. 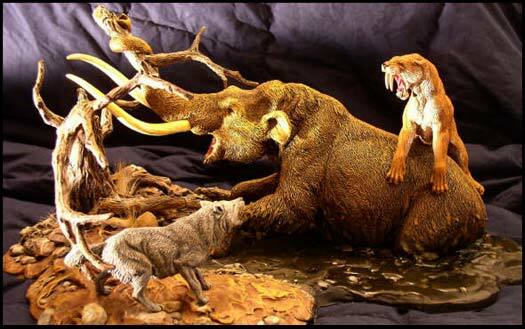 have caught and killed large animals, such as mammoths, bison and horses. victim, the scientists then think it directed a "killing bite" to the neck. perhaps explaining why they evolved a stronger overall biting force. meat - including that of ancient humans - may have led to its demise. between 60 to 100 pounds.